On the morning of November 3rd around 6:00am, John Maca (AB5SS) and I (W9TWJ) loaded up from John’s QTH to set out to active three grid squares that aren’t frequently heard on the satellites (a.k.a. “birds” in satellite operator lingo) – EL18/EL28 and EL19. A grid square is a rectangle and a way to divide up the surface of Earth (a square measures 1° latitude by 2° longitude) – a large majority of VHF QSOs include exchanging grid squares. The formal name is Maidenhead Locator System which was named after the town outside of London where it was developed. In short, this is just a fancy way of describing your general location. The ARRL has a nice “Introduction” to grid squares if you’d like to learn more. During satellite QSOs, operators exchange their current grid square as part of the QSO. There are many types of satellites; the more popular satellites have FM or linear transponders. The satellites with FM transponders are action packed and the QSOs are very short and fast. However, typically with the linear transponder satellites, the QSOs are more of the rag-chew type but operators still exchange their grid square. The weekend before (October 26) John and I met up at the shack for a trial run. The goals were to work out as many bugs as possible and prepare the cargo for transport. We had a few issues with the computer talking to the rotor and the computer wasn’t playing very nicely with talking to the radio either. Fortunately, we had some help from Jeff Harbour (AB4ME) and Mike Vandewalle (N8MTV) to get the rotor issues worked out. The computer to radio issues were debugged a few days later at my QTH. Our scheduled first stop was just outside of Bay City, TX for the gridline activation of EL18 and EL28. Gridline activations are very popular because it’s the old “two birds, one stone.” Operators receive credit for working both grids for one QSO. As you may of guessed, while 2 grids are very popular, the mega jackpot is for operators to work a quadrant – 4 grids for the price of 1! After scoping out the land and figuring out how we were going to stage the equipment, we began unpacking John’s car. The table was deployed and radio equipment began making its way onto the table. A pop-up tent was placed over the operating area to help protect us from that Texas sun. John started mounting the antenna on the mast while I worked to connect the radio and rotor to the computer. Once the antenna was ready, we placed the tripod on the roof of John’s car to give us a little more elevation. The generator was fired up (thanks to Dave Lee (W5OC) for providing it for our use) and the gear was turned on. Everything seemed to work as planned except the computer and rotor wasn’t working right. After a few minutes, I discovered the COM port wasn’t set to 1. With a quick reassignment, we were in business. With everything QRV, a celebrative cold beverage was a welcomed treat as John and I settled into our operating positions. We worked for several hours and had a nice log of stations worked. Around 3:00pm central, we decided it was time to QRT from EL18/EL28, go grab a quick lunch, and move towards our next operating location in EL19. There were many options for food, but time was limited so we decided to grab a Texas favorite: Whataburger. While we were in route to find our next location, AO-85 was going overhead so John found a road to pull onto and attempt to work it as we were in EL19 territory. AO-85 is an odd duck as it’s sometimes tough to get into as the satellite is somewhat deaf. Google AO-85 to read further on AO-85’s issues. Anyways, with only 5 watts, I was a little short on this pass and just couldn’t get through. We put the HT and Arrow back into the car and continued looking for a spot. We had trouble finding a location in EL19. We arrived in Wharton, TX where the surroundings were familiar to John. We looked at two parks in Wharton but decided they weren’t great operating places due to tree cover. The idea came that we head out to the Wharton airport. This location is where annually the South Texas Balloon Launch Team (STBLT) launches a high altitude balloon and again is very familiar territory to John (see STBLT website). We knew this location would be open and they were already familiar with ham radio operators. When we got to the airport, the gate was closed so it was time for Plan B. Nearby looked very promising, there was a small dirt road with an open look at the sky. There was an oil rig near which we determined the noise level would work and the noise coming from the highway was ok too. As we sat in the car deciding where we were going to put the table, mosquitos starting swarming around both windows and the windshield. Quickly the decision was made to abort Plan B in order to avoid being carried away by the mosquitos. Plan C had to be developed quick as we were working to be on the next pass of AO-85. John started looking around and I started looking on Google maps to see if any locations looked promising. It turns out we were only a few miles from another Texas favorite: Buc-ees. Their monster parking lots would surely provide us the space to deploy our equipment and get on the air from EL19. As we pulled into Buc-ees the question arose as to how we were going to ask for permission from the manager and not get a deer in the headlights look. 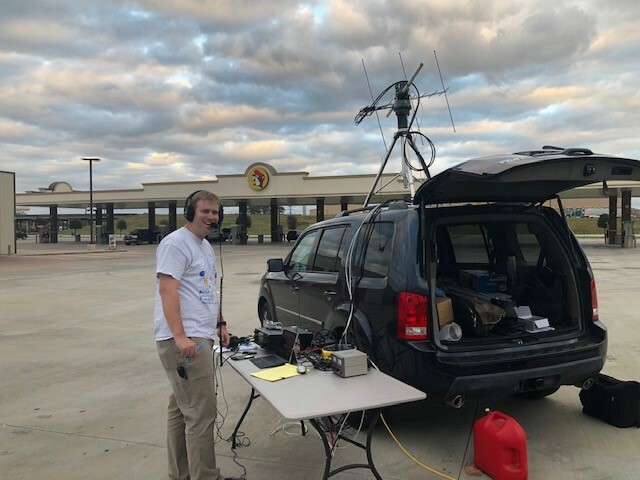 You’ve likely heard of National Parks On The Air, so when we parked, there were several jokes between John and I about starting the newest amateur radio operating location: Buc-ees Parking Lots On The Air. Funny, right? Well, just remember to be careful what you wish for! It was just several short months ago back in April when veteran satellite operator Chris Tabor (K7TAB) worked a gridline from a Walmart parking lot. When he posted on his twitter feed where he was operating from several other operators chimed in and stated they had operated from Walmart parking lots including several folks who said the Walmart parking lots they operated from were also on gridlines. And they say the rest is history: Walmart Parking Lots on Air (WMPLOTA) was born and about two weeks later the first ever WMPLOTA took place (see WMPLOTA website). As we approached the manager I was already trying to come up with Plan D. Lucky, the manager said “no problem” and allowed us to set up. We used the same set up as in EL18/EL28 minus the tent as the sun was starting to go down. Although we were in a far corner away from everything, the amount of traffic these stores see is impressive. So, naturally, we had several folks come over to see what was going on. We were able to operate for a couple hours and worked several FM and linear passes from EL19. As the 8:00pm hour was upon us and the next pass wasn’t for another hour, it was decided to go QRT from EL19 and begin the journey back to the QTH. Break down didn’t take us long as we had staged everything for a quick break down in case the manager changed his mind (or weather came in). After everything was packed away, we went in Buc-ees for a BBQ sandwich and hit the road back to Houston. 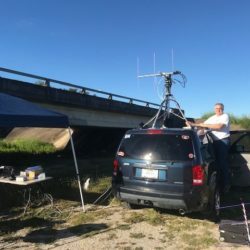 When we arrived back in Houston, we saw that AO-92 was coming over and we couldn’t resist not working it from EL29 – so we did. We stopped in at the W5RRR shack to drop off the borrowed equipment, worked AO-92, and then called it a night. Our satellite DXpedition was officially in the books. In the end, it was an extremely great time and a lot fun. A quick count of our logs shows we worked around 40 stations from EL18/EL28 and EL19. Brainstorming has already started for our next journey to active grids with the strong possibility of a quadrant! Check out a few pictures from our journey on W5RRR’s Facebook album: Satellite DXpedition to EL18/EL28 & EL19. Dave Lee (W5OC) for lending his Honda generator – it worked perfectly! Jeff Harbour (AB4ME) for his support during our trial run the weekend before and helping us work out the bugs. Mike Vandewalle (N8MTV) for phone support during our trial run while working out the bugs.